The Electric Light Station (1). (2) The Kings Arms (3) Tudor Laundry (4) Sutton Town Railway Station (5) Area of what is now Riland Tip. Aerial image showing Reddicap, Falcon Lodge, Langley Heath and fields eastwards toward the north south A38. Upper left (brown patches in this image) was St Georges Barracks. 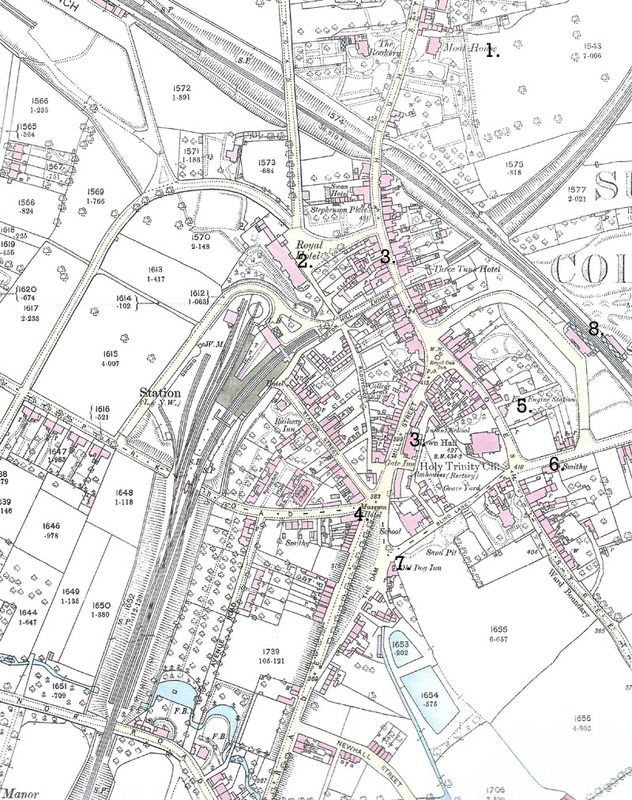 Here we have overlapping maps of Sutton Coldfield in 1913. They are, of necessity, large files, so may take a while to open fully. Park Road 1885, taken from the railway. The Trinity Church tower can be seen to the right rear. our soldiers shall march through, we'll to Sutton Colfil tonight. The West Midlands Police have something known as "Copper Cards" which depict early Police images and Sutton Coldfield images obtained from the Sutton Coldfield Library. I was in the local "nick", on another matter, and asked about these and was very kindly given a full set in a wallet. Having spoken to Sutton Coldfield Library (Marian Baxter) I can now share these images with you all. They are on various pages. These images are copyright. These images below are mainly as a result of an email from foreign climes asking for current images of places from their past. I am happy to oblige. Nov 2007. Eda (Wilkins) sent me this email: We moved in with my Grandparents in Jockey Road Boldmere after being bombed out in London. Sutton Park was my playground . catching stickle-backs in jam jars. At Wyndley loved going on the up and over netted swing, riding the miniature railway and the switchback. Where the leisure complex is now. Grandpa DeVille (Tom) was gate keeper at Boldmere until his death in 1956. Grandma ran the golf club refreshment cabin also at Boldmere (with my help)? She went on to pull pints at The Dog public house on the Parade in Sutton itself. My Uncle Ted DeVille was the head forester for the park, Our family, two brothers and three sisters, moved to 229 Coles Lane. The last but one house with the railway at the bottom of the garden. The Town Football ground was behind the cake shop in Coles Lane where we bought cake and pastry slices for a farthing on our way to school. My first school was Trinity Primary at the bottom of Trinity Hill and then Riland Bedford which was part built by the Americans who used it as a camp during the war. In my day, half Riland Bedford was a girls only school with no gym or showers. Assembly hall and playground for PE and netball. The school sports ground was at Moat House on the main road opposite where the Police Station is now. We walked there in a crocodile. ( the modern day walking bus) The bus depot was almost opposite the school. We moved to Dugdale Crescent Mere Green a few years after my Mother's death and my Dad remarrying where I watched the building of the TV mast from my bedroom window. Upon leaving school I went to work in the Public Library in the Main Street of Sutton which, I believe, was a Church or Chapel originally. After the library I worked for Brown and Polson who were then at Gravelly Hill Erdington. From there I moved to Devon after getting married at the Congregational Church in Park Road Sutton. June 2011. From Mandy Deakin (Moore): I was born and bred in Sutton though have lived in Toronto for over 30 years now. I am hooked on researching my family and have learned so much over the last year and a half and all your photos are bringing back wonderful memories. We are back in Sutton at least twice a year so I never really feel as though I have lost touch. I was born at Oakhurst maternity hospital on Anchorage Road and spent the next 20 years in Rectory Cottage, at the corner of Riland and Rectory Roads. The cottage is and it's once beautiful gardens are now very overgrown and a huge fence completely hides the cottage from view. We walked around the park with friends last year and an athletic chum jumped and took some lovely shots over the fence. I have traced my Higgs relatives back to the mid 1700s, in Sutton Coldfield. Presumably if I had the opportunity to check out parish records I could get further back. Rectory park was our playground growing up and what a wonderful place it was. We used to climb the hollow oak with the big kids and I can still remember ever nook and cranny of the inside of it, how smooth it was and where the foothold was. My mum and her friends used to climb the same hollow oak. She remembered the lightening that struck and claimed the large branch on the left. She also remembered the lad who jumped of that branch and broke his leg. My Mum was born in 1927(d. 1976) and always had stories to tell us of all our relatives who had grown up with the park playing a major role in their lives. My mum's dad's family lived in the Blabbs (bottom of Reddicap Hill and Coleshill Road) and then mum lived in Riland Grove before marrying and moving to the derelict Rectory Cottage, which my father rebuilt. Mum's grand-parents were Thomas Higgs and Eliza Deakin. Eliza was a midwife (complete with very smart uniform) and I'd love to find out information on local midwives of the era but so far haven't found anything. Thanks for all you photos of Sutton - They're lovely. Regards Mandy Deakin (nee Moore). November 2011: A surprise to find a pic of Hastilows Garage,Park Road - I recently started researching the Pope/Hastilow family tree. I am a 3rd generation Australian & have always had a of my sketchy idea detail about my ancestors living in Sutton Coldfield ie The Pope Family - farmers (of Church Farm, Reddicap Heath,& "Hill"(?)) & Hastilow family (of Holland Road). I am very pleased you have the pic of the Hastilows Business premises on your site! Thank you. The reason I mail you - I have attached a photograph of ?? Maney Parish Church. This photograph belonged to my grandmother recently passed. There is no writing or stamps on the back of the photograph- my grandmother told me her mother (?) was married in this very old church .i.e. Emily Hastilow of Holland Road,& Joseph Pope of Holland Road married in 1903- I have the original marriage certificate. The cert. very clearly identifies Maney Parish Church as the place of marriage. I have searched endlessly to prove the identity of this church but nothing at all similar has turned up - didn't happen to trip across this church in your travels at all?? Thought it may have been bombed during the war - The Church Commission are unable to help, as have the Church of England. As a matter of interest; The Pope family lived at Church Farm during the mid-1800's..the old maps were of particular interest to me. (Photos of St Peters are on the Maney page - mk). Molly Winifred Badham MBE (18 May 1914 – 19 October 2007) was a co-founder of Twycross Zoo. She trained the chimpanzees who appeared on the Brooke Bond PG Tips television advertisements in the 1960s to the 1980s. Badham was born in Evesham, the daughter of a herbalist and homeopath. She was educated at Town School in Sutton Coldfield. She kept animals from an early age, and bred dogs and ran a boarding kennel, before setting up a pet shop in her home town. Another pet shop in the town was run by Nathalie Evans. Badham bought a woolly monkey named "Sambo" from Evans. Although the animal soon died, the two business rivals went on to share a flat - along with two chimpanzees, Sue and Mickey - and would later become co-founders of Twycross Zoo. They moved to a bungalow in Hints, between Sutton Coldfield and Tamworth, in 1954, setting up Hints Zoological Society in the ¾ acre plot. Their collection of animals grew, and in 1962 they bought Norton Grange, a large Victorian rectory with 12 acres (49,000 m2) of land, plus farm buildings and stables. They opened to visitors as Twycross Zoo on Whitsun bank holiday, 26 May 1963. Over time, the Zoo expanded onto adjoining fields to cover over 40 acres (160,000 m2). Badham became an expert in the care of primates in captivity. She provided chimpanzees for PG Tips tea commercials (noatably Mr. Shifter) as a way to raise funds for the Zoo, and one of the Zoo's chimpanzees appeared in a Hammer Horror film with Peter Cushing. She kept studbooks for gibbons and chimpanzees. The Department of the Environment appointed her as an Inspector under the Zoo Licensing Act 1981. The Zoo grew to have the largest collection of primates in the world. The first Colobus monkey bred in captivity in Britain was born at the Zoo in 1969, and Britain's first Bonobo was born at the zoo in 1994. Badham and Evans set up a charity, the East Midlands Zoological Society, to which their animal collection and zoo premises were donated in 1972. She published two books with Evans and Maureen Lawless: Chimps with Everything, published in 1979, and Molly's Zoo, published in 2000. She also participated in a television series, Molly's Zoo, in 1999, about the running of the zoo. Badham was a founder member of the National Federation of Zoological Gardens of Great Britain and Ireland, and a member of the International Union of Directors of Zoological Gardens. She was awarded an honorary BSc by Leicester University in 1982, and received an MBE in the Queen's Birthday Honours 2002, for her services to the conservation of endangered species. She retired, becoming director emeritus of Twycross Zoo in 2003. Molly died on October 19, 2007 at the age of 93. I stumbled upon your most excellent site yesterday when I googled Edward Holbeche and got the 1913 list I am part of the Sutton Coldfield Great War Project. We are researching the soldiers who died and are listed and missing from the memorial. I was handed a handwritten and none internet researched diary done by Andy Coles (out of him needing something to do) between 1998 and last year. I am a genealogist and did belong years ago to the local research group. My aim was purely to transcribe his work but ended up researching the families- still a very long way to go. But through the paper I am in touch with librarians, church members, cricket club, allotments and so on all commemorating WW1 in some way. A huge contributor is David Phillips teacher BVGS who has written about their boys who served. I found many names on your 1913 list cross reference with our dead men. Are you interested in joining our group? Some people have contributed just their own family info but have still joined to offer bright ideas!! We are unearthing some interesting stories which marry in with your work I have also researched my husband's family - the Moore family cycle dealers Parade on your 1913 list. Dad in law died 2008 but mother in law is very much alive living near the Boot. Sutton born and bred and now 87 she is a fount of local knowledge if you feel like grilling her ever. She is drip feeding me old maps pamphlets postcards etc she has accumulated but it is drip feeding! 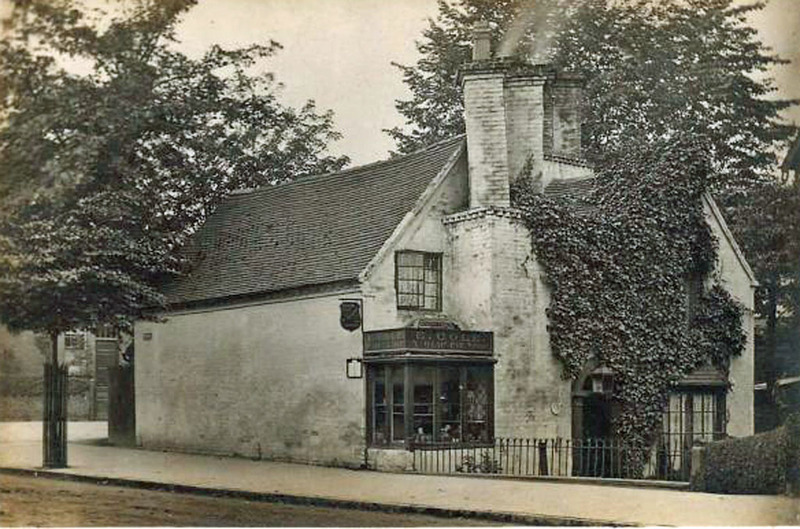 I did a it of research about three years ago on Belwell Lane and its occupants as my sister rented the old smithy behind Belwell curtains and was interested in its origins. Last year I worked on Dr Cyril Christopher an Oldbury boy who became a doctor of music and organist at Carrs Lane. My sister purchased his house when he died - Cremorne Road That took almost a year! Everyone keeps asking what we are going to do with our work once it is finished and the answer is I have no idea. A website like yours would be good but I tried a blogspot and really messed that up! I have no concept of what can work on a website and no one who understands local history to ask I would be happy to pay if it is not a fortune but how does all the info get uploaded? I have severe rheumatoid and all this typing is painful so wondered if word docs can be transferred but no one I know can answer that one. The other part of our research is to collate info on the actual war memorials and why the main one is so incorrect. This is proving a challenge so I have put that on the to do later list. Everyone who has joined the group have given consent to share their details as per data protection and we have a generic email address for use in newspapers etc which is suttoncoldfieldgreatwarproject - at - hotmail.com - replace -at- with @ to use email.